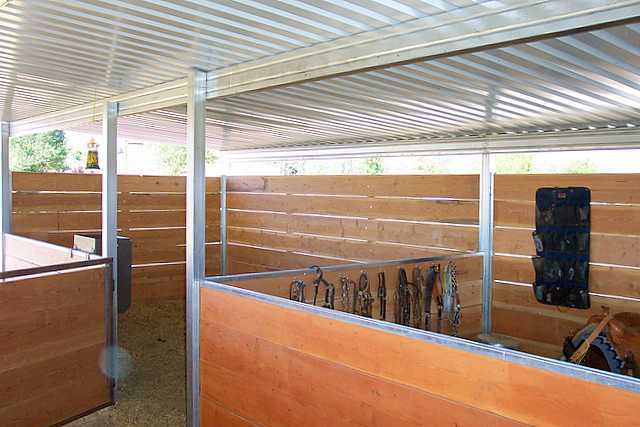 Horizontal wood siding can be easily added to many EQ-Wine Covers kits. 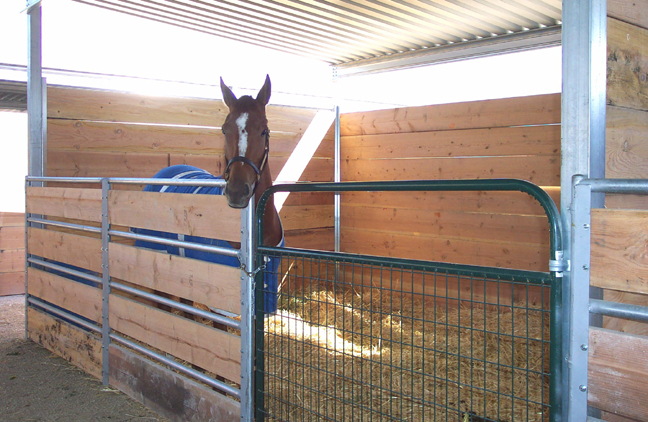 We sell "stall channel" in 10' lengths, for $40. 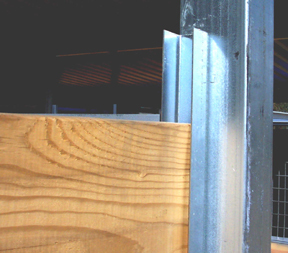 Cut in half for 5' walls, or use full length, just attach to the posts with the supplied Tek screws. Purchase locally any "two by" lumber such as 2x6", or 2x8", cut to length, and drop in the channels. 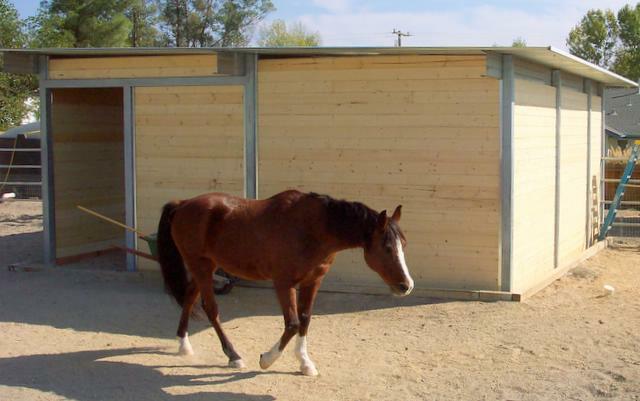 On short 5' high walls, use a piece of stall channel across the top piece of the wood to stop the horses from chewing the top edge of the board. Close-up of stall channel attached to 4x4 post. After finding final height of wood, just cut off excess channel, add top cap if needed, and you're done! You can easily add doors, screen panels and more options available through mail order outlets. 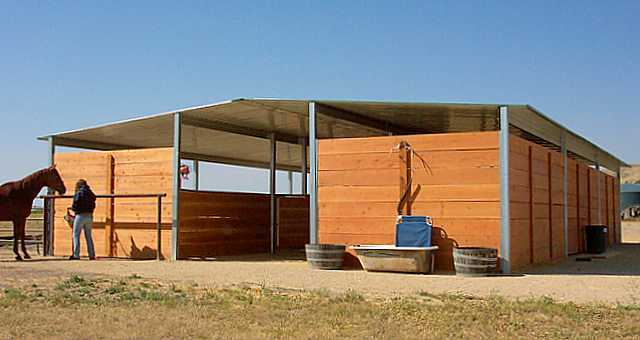 It's easy to add wood to a Mare Motel for an inexpensive, sheltered setting for your horses. 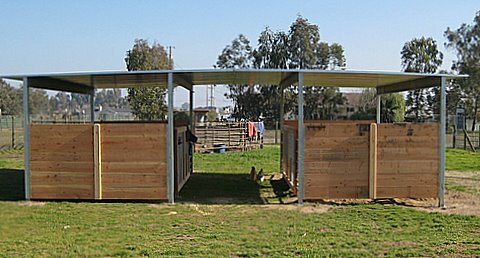 It's easy to add tack rooms, or hay storage areas. Just add as much stall channel, and wood as you like. Any size structure can be set up for wood siding. Just call us with your ideas, and we can help you get the desired results! Side view of 24'x24' structure shown at left. Tongue and groove lumber, also know as T&G, was used on this project. These customers liked their 36' x 15' three sided shelter so much, they ordered another only two weeks after the first one was delivered. This photo was taken as the painters were putting on the finishing touches on the first shelter. Back side view of shelter shown at left. 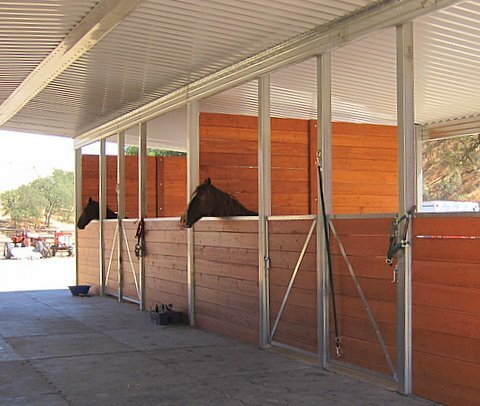 Wood siding is easily applied to posts using our exclusive stall channel product. Attach channels using the supplied self tapping screws, then drop in your own 2x6, or 2x8" lumber. Ten foot lengths of Stall Channel are $40 ea. We will cut pieces in half for you at a small charge if you wish to have 5' high stall walls (seen in photos above on this page). 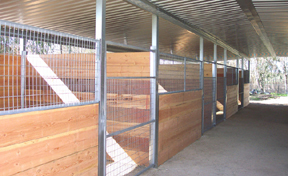 You can use our Stall Channel to create sides on any existing building. It is easily attached to round or square posts, using the supplied screws. Just drop in your own, locally purchased lumber, and you have the most cost efficient walls available.